I am an interdisciplinary artist who works primarily in the field of print media and painting. With a deep interest in Earth and Atmospheric Sciences, I am attracted to scientific maps and satellite images as a means of exploration. By looking at these images, I can envision myself on the ground and locate myself as an observer and an explorer. Through the lens of the Anthropocene (the critical geologic epoch in which human action has resulted in significant alterations the planet), I seek to understand the bigger picture through a place’s topography. The topography of a place is at once rooted in the natural and concrete world, but also exists as an aesthetic abstraction that can be read subjectively by the viewer. To me, this sort of multistability inflicts an inherently human, emotional component upon the work. My process involves the intake of visual and theoretical information from the natural sciences, as well as the surface processes of geomorphology and the effects of human intervention upon the landscape. Additionally, I have a keen interest in states of matter and how they interact on different temporospatial scales. 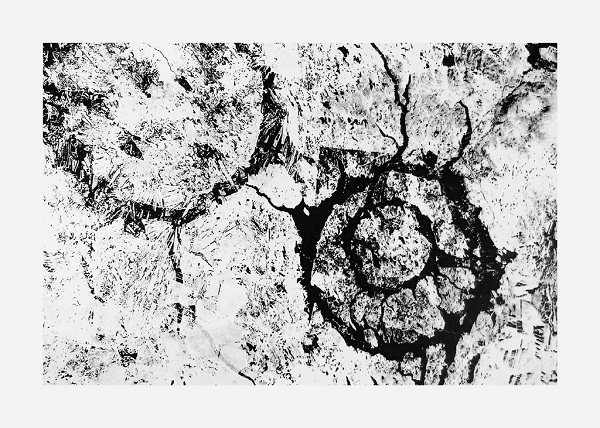 Since 2013, I have been developing a series of works based on digitally collaged and altered public domain satellite imagery to create fabulated landscapes – places that do not physically exist, but can be read as if they do. Recently, I have expanded the topographic aesthetic into the fields of painting and sculpture, where material manipulation allows for a more immediate response than with traditional printmaking methods. Together, the different mediums encompass technological, human, and material experience. 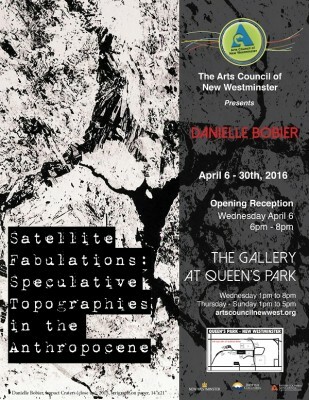 The title of this exhibition, Satellite Fabulations, is partially appropriated from Donna Haraway’s “SF, Speculative Fabulation and String Figures” where she mathematically and theoretically delineates a notyetexisting world titled Terrapolis. I chose to adopt the use of the word “fabulation” as the works in this show investigate speculative and chimeric topographies. Danielle Bobier was born in New Westminster, BC, in 1985. She lives cooperatively in New Westminster and splits her studio workspace between the Royal City and Vancouver. Previously, she received the Fine Arts Diploma from Langara College where she was awarded the 2012 Painting Studio Award. She is currently completing her Bachelor of Fine Arts (Visual Arts) at Emily Carr University and is set to graduate in May 2016. Her work can be found in the Langara College Permanent Collection, the Wayfinding: Art for Patients with Dementia Research Collection in conjunction with UBC school of Nursing, and in private collections internationally.